A Virtual Private Network (VPN) is a useful tool to hide the browsing location and maintain privacy. It protects the IP address from websites and third parties, prevents geo-targeting, defeats the deep packet inspection undertaken by Internet Service Providers (ISP), and allows the user to browse the web in a cloak of secrecy. It blocks unwanted marketing and shields the user from cyber crimes as well. IPVanish VPN caters mainly to the North American and European markets. It offers 3500 IPs spread over 93 servers located across 44 countries, including USA, Canada, UK, Portugal, Spain, France, Germany, Belgium, Netherlands, Denmark, Sweden, Poland, Romania, Italy, Austria, Hungary, Switzerland, Czech Republic, Turkey, Russia, China, India, Egypt, South Africa, Japan, Malaysia, Singapore, and South Korea. The user has the freedom to connect to any server they desire, and change servers any number of times. 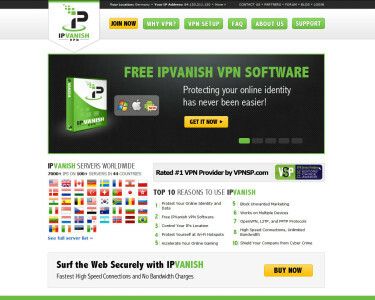 Compare IPVanish on www.vpndienste.com or read a big review on this website. IPVanish VPN offers shared and dynamic IP addresses, wherein 20 users may use the same IP address at the same time. This however does not compromise speed or security. The service, in fact, is noted for its high grade security. All plans come with NAT Firewall and wi-fi hotspot protection. IPVanish keeps logs of user activity, including log-in time, log-out time, session duration, IPs used, and bandwidth used. IPVanish VPN has flexible options of one, three, and 12 months. All options are unlimited high speed connections in OpenVPN, L2TP, and PPTP protocols, with no bandwidth, transfer, or reconnection limits. It is possible to install IPVanish VPN software on any number of computers, including mobile devices, and use one OpenVPN connection and one L2TP or PPTP connection simultaneously. IPVanish is an established provider, with 15 years of operations behind them. A major claim to fame is its robust 24×7 tech support, allowing users to easily tweak the solution to their operating system.